Stuck on the toilet again!! Damn Period Poops! As if cramps aren’t enough to deal with, the feeling like you have to live on the toilet as you almost pass out is a nightmare, to say the least! I recall blocking my calendar when I knew it was coming, there was no way I could do very much on that day, and I honestly thought that was fairly normal. Boy was I wrong. To think my last period just showed up when I wiped and I could go on with my day as nothing happened – is nothing short of a miracle based on my history. Having a pain free period without hours on the toilet is completely normal. Except if you have endometriosis that is. Then you are all too familiar with my story. Bowel movements are meant to be consistent. Once, or maybe twice a day, without straining, without pain and should be “S” shaped. They might vary slightly on occasion, but at a high level, that’s what’s considered “normal”. Normal and regular poops help you eliminate waste, toxins and by-products from your body. This includes excess estrogens or xenoestrogens (which are endo-triggers) and toxins from the environment and from food. What’s happens during your period that can increase cramping and keep you on the toilet have to do with 2 factors which also start with “P”: Prostaglandins and Progesterone. Prostaglandins are hormone like substances that are derived from fat and are released when there is a tissue injury to aid recovery, for ovulation stimulation, at the time of your period and more. When released at the beginning of your cycle, prostaglandins work on smooth muscle to contract and release the uterine lining but can also act on the bowels (smooth muscle) and make them contract if they are in excess. Like all other things in our body, there’s a fine balance for optimal health as both are much needed. However, our western diet and lifestyle have increased arachidonic acid (from Omega 6 fatty acids) & Series 2. 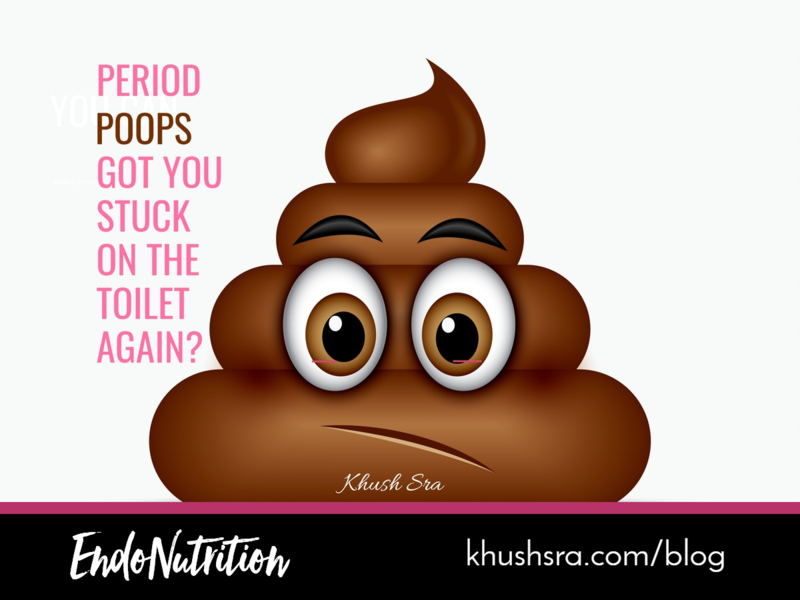 This gets us way off balance and increases inflammation, resulting in excess cramping in the uterine and in the bowels hence the period poops. Women who take anti-inflammatory pharmaceuticals like Advil, Motrin or Naproxen are reducing the inflammation by blocking the Series 2 pathway. Essentially they are masking the inflammation without treating the underlying triggers. And then there’s Progesterone, the second big factor complicating your bowel movements. Nothing, as long as it’s balanced and the gut is working fine. You see, progesterone is a hormone that increases in the second half of our cycle and helps our uterine lining build in preparation for a potential pregnancy. It has a relaxing effect on our mood which is felt in early pregnancy, AND on our bowels and if our gut is not working optimally can result in constipation. Now the combination of an imbalance of prostaglandins and excess cramping and constipation in the second half of the cycle can make for even worse loose stools! Keeping the prostaglandins in a healthy balance is key. You can support this balance by decreasing your source of omega 6’s from processed foods, but also from increasing your intake of cold water fish, flax seeds, walnuts, chia seeds and nato. Consider taking an omega 3 or GLA supplement – as diet is often not enough. This is especially important in the second half of your cycle. It’s everywhere and with good reason. Inflammation can be amplified when we are dehydrated and water is also a factor in constipation. Sufficient water intake is important at all times for bowel health, avoiding water that is close to meals or is cold as that can tense up the intestines. Start with a goal of 2L a day and up to 3L depending on weight and level of physical activity. If constipation is something you face in the second half of your cycle, taking magnesium at bedtime can help. Magnesium is a muscle relaxant and helps draw water to the bowels making it easier to eliminate the bowels. Magnesium can also reduce PMS symptoms, so this is key during the week before your period. Some big triggers for inflammation are sugar, dairy, red meat and processed/fried foods. The week before the period is a highly sensitive time as hormones are fluctuating and often the pro-inflammatory prostaglandins are higher in most individuals. Trigger foods are adding flame to a growing fire and avoiding these will help support a smoother transition to day 1 and less time on the toilet. The gut is more bacteria than anything else. Proper function requires a healthy microflora which can be supported by eating foods rich in probiotics such as sauerkraut, kimchi and coconut kefir – just be careful to stay away from sugar-filled yogurts touting high probiotic content. Taking a probiotic supplement is also an option (good quality and avoid if you have SIBO). Ensuring a good balance of healthy bacteria will not only support digestion but also the gut immune system and reduce inflammation. Place carrots and garlic into a clean canning jar, packing them in tight. Be sure to leave about 1 inch of head space at the top. P.S. The 7 Day Endo Program is a perfect place to start balancing the hormones and supporting your gut. CLICK HERE to sign up before it closes this week.